Americans are living longer than ever before. Considering the current mortality conditions people who live to 65 can expect to survive another 19.3 years. Though this data from the Agingstats.gov report is rather cryptic. While most want to live until 65 (and beyond) we surely want to do more than survive for another 19.3 years. 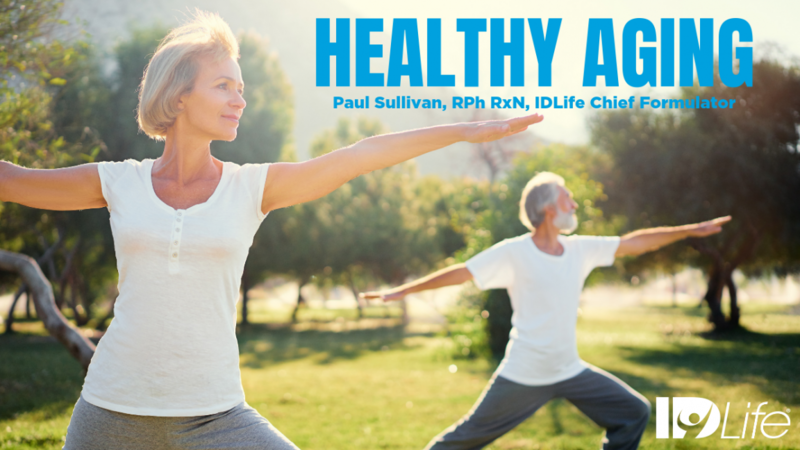 At IDLife, we have always concentrated on improving quality of life as well as extending the quantity of life. Reports on aging have reams of numbers that reflect a blend of ethnicity, Diabetes, CVD and Prescription use. • The leading causes of death for Americans, in descending order, are: heart disease, cancer, chronic lower respiratory diseases (such as COPD), stroke, Alzheimer’s Disease, diabetes and unintentional injuries. • Cardiovascular disease (CVD) and cancer are the leading causes of death for non-Hispanic Whites, non-Hispanic Blacks and Hispanics. • Diabetes is the 7th leading cause of death among non-Hispanic Whites, but fourth leading among non-Hispanic Blacks and Hispanics. • Diabetes in the U.S. has grown to epidemic proportions affecting people of all ages. According to the U.S. Centers for Disease Control and Prevention, 30.3 million Americans have been diagnosed with diabetes which includes 7.2 million that weren’t even aware of it. On top of that 84.1 million Americans are diagnosed at the prediabetes stage. • Prescription use has increased 96% from 2.3 billion in 1996 to 4.5 billion in 2016. • Prescription use has increased 45% on an annual per capita basis from 8.7 per person in 1996 to 12.6 per person in 2016. There has been some progress on death rates from several chronic diseases, but the increase of prescription use plus increases in preventable diseases have continued to surge. One might argue that some people that age well do have good genetics and some that are disease prone have poor genetics. Recent and ongoing research is utilizing the study of “Epigenetics,” which involves how cells read genes and may be influenced by several elements including nutrition, lifestyle, age, and environment that can modify gene expression. This is very exciting and gives us hope that improved nutrition, environmental, lifestyle and dietary habits can in fact help us overcome a genetic influence while a lifetime of healthy habits could help us reduce specific disease susceptibility. • Smoking – It’s best to stop smoking. But, if you will not or cannot stop, then know that IDNutrition (IDN) adds necessary antioxidants such as Vitamin C that you may be lacking as a result. • Lack of Exercise – IDLife has a comprehensive list of products to facilitate exercise including Energy, Weight Management, Protein Shakes and the Workout Products. • Excess exposure to Environmental, Occupational and Lifestyle Toxins – The IDNutrition Assessment added a new section this year to address the toxins each of us are exposed to in these categories, providing nutrients that help chelate and detoxify your system at the right time of day. • Nutritional Deficiencies – The IDNutrition Assessment helps to identify the needed nutrients based on your health assessment answers on dietary habits, lifestyle, health goals, medical conditions and prescription use, and offers personalized recommendations and solutions based on clinical studies. • Dependency on Prescription Drugs – IDLife does not claim to address this issue. However, as stated above, if you must take prescriptions you should follow the IDNutrition Personalized Nutrition Program. The IDNutrition Assessment identifies and replaces the nutrients being depleted by those drugs. IDNutrition also identifies which of your drugs may interact with certain nutrients and removes those nutrients from your program to help prevent Adverse Drug Events or side effects. • High Stress Lifestyle – IDNutrition provides certain nutrients to help reduce stress as well as replace nutrients that may be depleted by stress, while providing the right nutrient at the right time. IDNutrition is built around balancing your “flight or fight” daytime need for focus and energy with your “rest and digest” nighttime need to recuperate, regenerate and sleep to be better prepared for tomorrow’s challenges. We also provide a Tri-Phasic Sleep Strip (IDLife SLEEP) that will help you get to sleep, sleep soundly and awaken refreshed. • Genetics – Consistent with our efforts to help influence your genes in a positive, healthy manner, IDNutrition contains a whole arsenal of antioxidants, minerals that act as cofactors, and B-vitamins that act to help modify gene expression. Life has an expiration date, but you have more control than you think over the quality and quantity of your life. There are plenty of resources out there on aging! A thought that will stick in my mind forever was when I asked my dear friend Ziglar if he was ready to retire at age 80. He responded as quickly as I came to expect, “Retire, Paul? Not for me. I can’t retire as I just got re-fired!” Meaning, that while all of the information above is appropriate and helps healthy aging in many ways, a positive attitude always helps to compliment all those new positive external and internal habits you have created. Our goal at IDLife is to optimize the quality and quantity of our years. We want your later years to be filled with vitality and joy. Start today, no matter how old you are! 1. Prescription Drug Trends – Am Chartbook by The Kaiser Foundation. National Association of Chain Drug Stores, The Chain Pharmacy Industry Profile.